I’m continuing my series looking at digital transformation trends in various industries. Previous focus has been on trends in sectors such as healthcare, retail, finances and media and entertainment. Today, I’ll discuss how digital transformation has revolutionized the automotive industry. 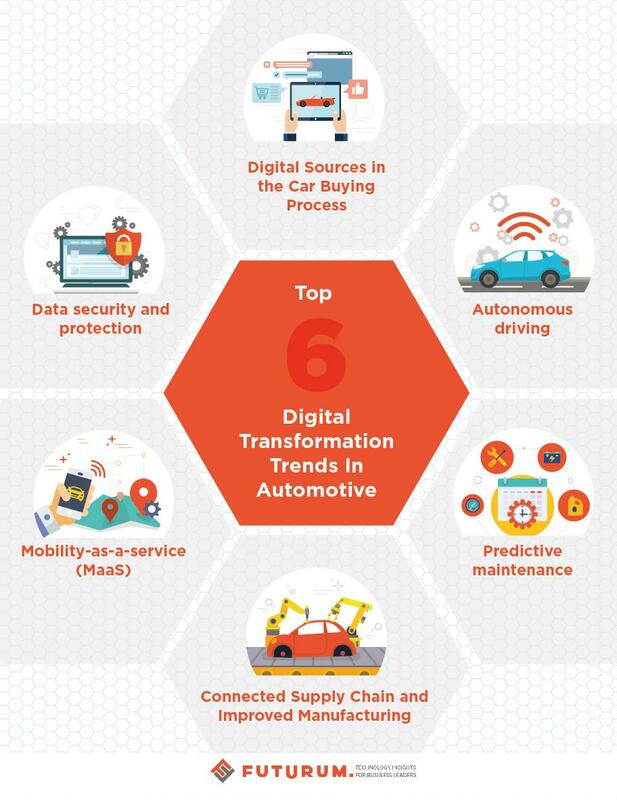 By 2020, growing digitalization and advancements in technology will have increased the automotive industry investments to $82 billion. The automotive industry has learned quickly that they must meet consumer demands for a digitally enhanced experience when they are researching, purchasing and operating a car. These are the trends currently transforming the automotive industry. Car buying used to be a source of stress, with the pervasive salesman stereotype proving true in tense back and forth negotiations. Consumers, equipped only with a newspaper ad, felt ill-informed and pressured when buying a new vehicle. Today, consumers are researching a car online before even stepping foot in a dealership. Thanks to websites like TrueCar and Edmunds, all pertinent buying information is available in a second and at the click of a button. What’s more is that actual showrooms are slowly being transformed into digital market places equipped with virtual reality capabilities. A great example of this is the Audi virtual showrooms in London where only a handful of actual cars are on display, dwarfed by the giant video screens displaying relevant buying information. Virtual reality capabilities allow consumers to open doors, sneak a 360-degree peek inside and out, and even hear authentic sound effects of their potential new model. In response to consumer-driven expectations to research and buy online, companies are likely to begin selling cars and parts directly through their respective websites. Elon Musk predicts the autonomous vehicle (AV) is “just going to become normal. Like an elevator. They used to have elevator operators, and then we developed some simple circuitry to have elevators just come to the floor that you’re at, you just press the button. Nobody needs to operate the elevator. The car is just going to be like that.” The possibility of cars driving themselves will become a reality thanks to the collaboration between several advanced technologies. From GPS to sensors to cameras to connectivity and algorithms, AV will ultimately handle all situations and all conditions. The expectation is that AV will decrease automotive accidents and deaths, and give those previously constrained the freedom of travel. Assisted-driving, another facet of autonomous driving, is becoming more mainstream every day. The goal is that this feature becomes more readily available in the less expensive models. It is anticipated that assisted-driving technology will be so effective in reducing accidents and lowering insurance costs that in the next 10 years, it will save consumers upwards of one trillion dollars and, most importantly, more than 900,00 lives. Self-driving technology, while not as prevalent on the road, is being experimented with all over the world. Various regulations and barriers are impeding the growth because, as with anything that becomes digitized and connected to the Internet, the threat to cyber security increases exponentially. As we’ve seen in other industries, digital transformation trends are being used to personalize a consumer’s experience and customize to his needs. The automotive industry is no different. By digitizing the connected supply chain, it drives costs down, more effectively engages the consumer, and collects and uses data to better serve consumers. Recently, the industry has moved away from the national and regional production and toward a more decentralized approach for both production and the supply chain. In addition to lower costs, this has allowed for more transparency in the supply chain, accelerating design, manufacturing, and delivery. Communication made possible by social media and the Internet of Things provides instant feedback that “talks” to a smart factory. A smart factory uses advanced algorithms and AI to perform tasks like creating schedules and managing workflow, and has robots working alongside humans on assembly lines. These connected technologies increase productivity and decrease defect rates as shown in a small electronics plant in Germany. In 1990, the plant was 25% automated, compared to today’s 75% automation. Further digitization has dropped defect rates to below 12 per million, and output has increased 8.5 times. Despite obvious financial barriers in constructing these smart factories, the giant improvements to production, flexibility, and performance will likely overcome this hurdle. Next article Autonomous Car Crashes: Who – or What – Is to Blame?